The Eating with Ellie group made Pork Tenderloin with Fennel and Grapes, which is found on page 119 of Weeknight Wonders, You can see the recipe here. 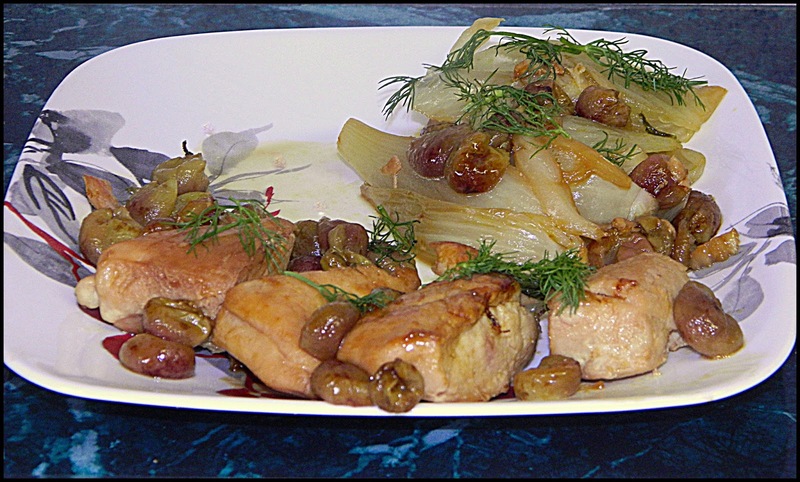 I used chicken breast, olive oil, fennel bulb, vegetable broth, red grapes, lemon juice and a tiny bit of black pepper. This was a cinch to make and timewise was a dream. We are having it for dinner so I don't know how much we will like it or not but based on the other Ellie cooks, I am pretty sure, this will be a success. Check out our EwE page and see what others cooked and what is coming up in the future. We would love to have you join us. We all like Ellie's healthy and tasty recipes and think, you would also. I hope you liked it Chaya. Tim and I really enjoyed the pork version, and you are a champ for making it with a substitute meat. This looks really good. I love the combination of ingredients in this dish. Thanks for sharing this great recipe at the This Is How We Roll Link Party! See you on Thursday! I like the idea of the chicken. I think I could eat that more with grapes than I could the pork. Looks delish.